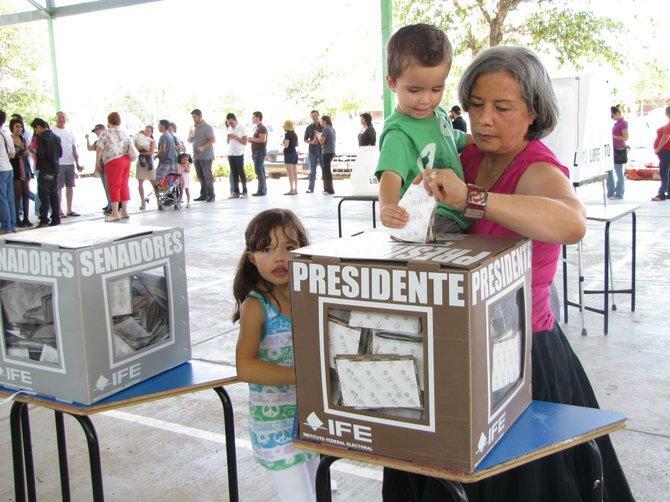 Patricia Terrazas casts her ballot for the Mexican presidential election in Ciudad Juárez. She is both a Mexican citizen and a U.S. resident who lives and works in El Paso, Texas. Standing before television cameras shortly after his victory, Enrique Peña Nieto smiled and waved with a head of perfect hair and a celebrity wife by his side. Below him, an audience chanted, "Presidente, Presidente"
"I assume this great commitment to Mexico with excitement and total responsibility," he said in his first address to the nation after the Federal Electoral Institute officially announced his win. Peña Nieto swept the election with a nearly 8 point lead over leftist candidate Andrés Manuel López Obrador. A thousand miles away from the capital, in the border city of Juárez, revelers celebrated the PRI's victory on a downtown street corner. Claudia Perez, a law student, could hardly contain her excitement. "I'm very happy, very happy," she said. "I think Enrique Peña Nieto is the ideal candidate to help Mexico work through it's problems." Coming in third place was Josefina Vasquez Mota, the first woman candidate to make a significant bid for the presidency. She belongs to the PAN, the National Action Party of outgoing President Felipe Calderon. During his administration, Calderon launched an unprecedented offense against organized crime. As a result, Mexicans nationwide suffered a tsunami of violence that continues to this day. Roberto Martinez is a political science professor who served as an election observer Sunday. "Twelve years of the same party, unfortunately the people have not seen the politics work in their favor," he said. "Insecurity is rampant and, yes, without a doubt, people are sick and tired and they are going to manifest their vote for another party." 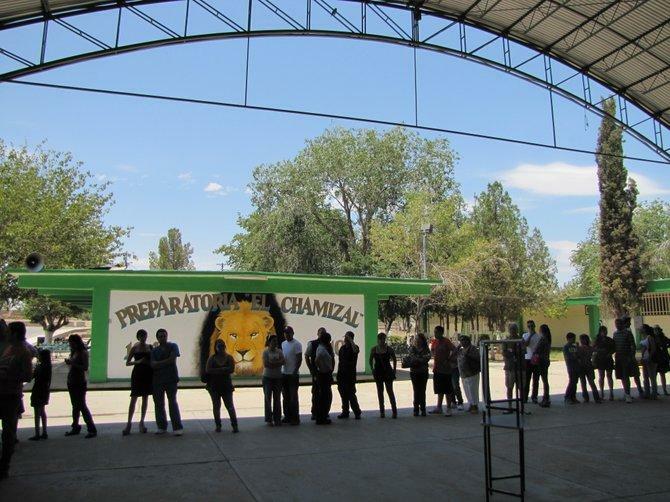 Earlier that day in Juárez at a special polling station for out-of-town voters, families waited up to three hours to cast their ballot. To pass the time a young girl played patty cake with her grandmother. One of the voters was Carlos Herrera, who works for an insurance company in El Paso. He cast his ballot for Peña Nieto. Herrera has dual citizenship in both Mexico and the United States. In both countries his primary concern is the economy, which is why he voted for the PRI party. "They wanted to implement an economic system to help increase employment in Mexico," Herrera said. "That's one of the biggest problems right now in Mexico there's not enough employment." Part of Peña Nieto's economic plan is to open the state owned oil company, PEMEX, to private investment. He also wants to reduce crimes like extortion and kidnapping which cripple the business community. Crime continues to be a top concern in Juárez. At a polling station in a far southern colonia, Javier Puente tears off ballot sheets for voters. He's the volunteer in charge of this station, but he can't vote. "Two nights ago, we were robbed at gunpoint," Puente said. He said his electoral ID was stolen, which in Mexico, is a federal crime. The thieves also stole his car and a stack of ballot sheets. Even so Puente says he has faith in the electoral system here. "I've witnessed the voting today," he said. "So far it's been clean and transparent." Although Mexico continues to confront many obstacles, maintaining a democracy does not appear to be one of them.